When the weather is warm and we tend to spend more time outdoors in lawns and parks, grass stains are inevitable. These stains also affect shoes when we indulge in outdoor sports activities like football, cricket, badminton or any sport that is played on a grass turf. Unfortunately, these green grass stains are ugly. They appear as moldy green patches on the surface that ruin the overall look of a shoe. So, what do you do if your shoes seem to be stained by grass? Do you just leave it as it is, take it to a professional cleaner or try something at home? The good news is grass stains can be removed completely, if you tackle it promptly and in the right way. We will look at the different ways in which we can eliminate this problem over the course of this guide. Through this tutorial, I will guide you through the following steps and provide comprehensive information on what to do when your shoes have grass stains on them. Any stain that sets in is difficult to remove. So, one of the first things to remember is that you should attack any grass stains on your shoes promptly, to enjoy best results. Secondly, understand that the method that yield results will differ from one material to another. So, the same procedure may not yield similar results if you attempt it on two different types of shoes, say canvas and suede. Since stain removal is often a vigorous process, it is important that you follow instructions and take due care to ensure that your shoes incur minimum damage during the cleaning. Grass stains are organic stains, caused by the green pigment called chlorophyll that colors plants green. They are vivid in appearance and can be rather stubborn to get out. 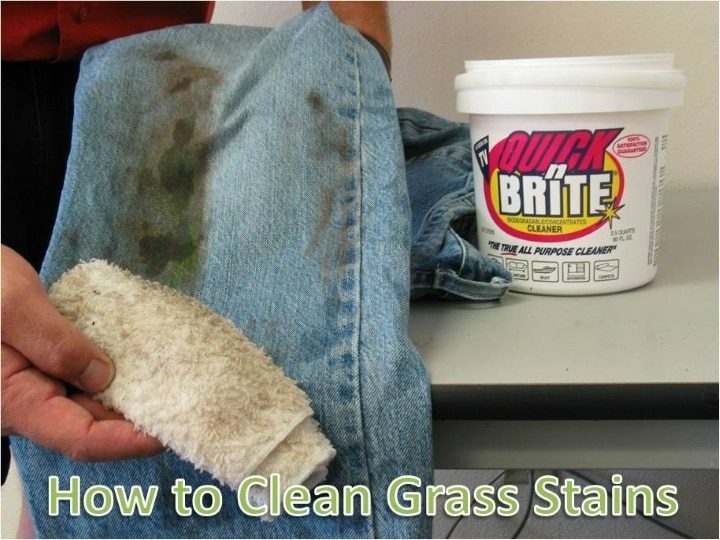 Grass stains can also have dirt, mud and other sticky stuff mixed in. So, it requires quite some effort and time to get out. Traditional, household cleaners and detergents have been used to get these stains out, and they work to a great extent. There are also special stain removers that can address the issue. Vinegar: Vinegar is a pantry staple that is effective in removing various types of stains, including grass stains. Preferably use distilled white vinegar, as it is colorless and is very efficient. However, vinegar may be useful only if the stain is partial and over small patches of the shoe surface. If the shoe has dark colors, we advise doing a patch test first before rubbing vinegar over the entire stain. This will help you identify if there are any chances of discoloration due to the use of this acid medium. Plain Water and Laundry Detergent: This is often effective for fresh stains. Dip the stain in a mixture of laundry detergent and warm water and then brush it out. However, this method shouldn't be followed if the shoe isn't meant to be washed or become wet. Only shoes that are made from nylon or canvass usually benefit from this solution. Rubbing Alcohol: Easily available at pharmacies and grocery stores, rubbing alcohol is a versatile stain remover that can be used on grass stains also. Use a cotton ball or rag that is dipped in sufficient quantity of rubbing alcohol. Then apply it to the stained area and rub it slowly in circles. The stain should dissolve and come off. However if it is deep-set, you may have to apply some elbow grease to rub it out. Step 1: Mix equal quantities of bleach and hydrogen peroxide and dilute with twice the quantity of water in a bowl. Step 2: Transfer this to a spray bottle and apply it to the stained area. Alternately, you can also use a cloth dipped in the solution, but take care to avoid contact with skin. Step 3: It is recommended to leave the solution on the stain overnight, or at least for several hours to penetrate the stain and be effective. Step 4: Wash the surface thoroughly with plain water and watch the stain disappear. Baking Soda: Baking soda is another effective stain remover that reacts with the organic stains and causes it to disappear. To use it, simply wet some baking soda with water and apply it as a paste on the stain using a brush. Leave it on for an hour. Then scrub the area vigorously, and wash the stain away with plain water. Commercial grass stain removers are specifically designed to get rid of grass stains. These are usually the most effective at tackling the problem with immediate effect. However, they are also often more expensive than the traditional solutions we earlier looked at. They may also involve stronger chemicals to effectively perform the function. When using commercial stain removers, it is advised to do a test run on an inconspicuous area of the shoe first? This will help you identify if there is risk of fading or color bleeding. If there is no visible damage, you can proceed with addressing the entire stain on the surface. Where outdoor activities are concerned, canvas shoes are a very popular choice. These are also easily affected by grass stains, and bear visibly ugly marks as a result. 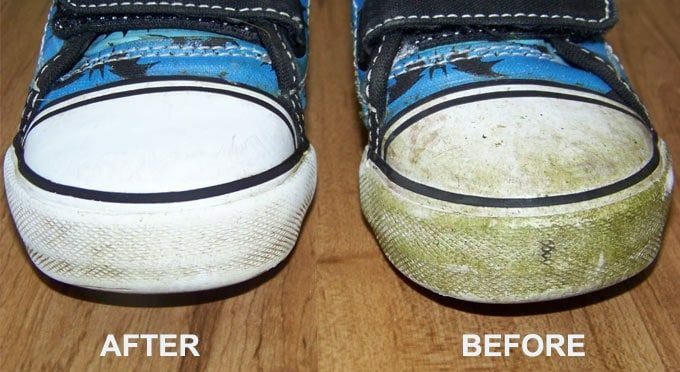 To eliminate grass stains from canvas shoes, you will need dish wash liquid, vinegar, baking soda and water. The following are the steps to follow. Step 1: Brush off all the loose dirt and mud from the surface of the shoe. Step 2: In a bowl, mix water and baking soda to form a paste. Apply this over the stained area. Step 3: In another bowl, mix half a cup of vinegar and a cup of water. Squirt some dish wash liquid into the mixture and stir it. Step 4: With a toothbrush dipped in this solution, scrub the grass stain slowly but thoroughly. Step 5: Finally rinse the shoes with lukewarm water and let them dry thoroughly. No signs of the stain should remain. These materials are highly prone to grass stains. Unfortunately, traditional methods that involve water and washing aren't recommended as these can ruin the delicate form of these materials. Specially designed leather and vinyl commercial cleaners like Quick n Brite are suitable for the purpose. This is safe to use and will not cause any damage to the material. Stain removers like Quick n Brite can be directly applied to the stain and rubbed in. This will slowly break down the stain, and it can be wiped away once the stain lifts off the surface. It is highly likely that you will experience quite some success when you follow the methods listed in the previous sections. However, if the stain is deep and has set in and it's been a while, it may not be easy to get rid of it so easily. If your efforts with the previous methods proves unsuccessful, you have two options. Either get rid of the shoes and replace it with a new pair. 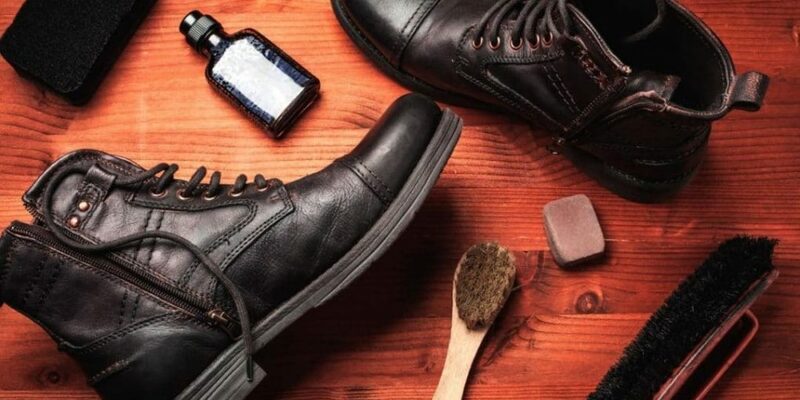 If it is an older pair of shoes and relatively inexpensive, this may be the best approach unless you choose to continue wearing it with the stain as such. The other option is to have it professionally cleaned. Find a professional shoe cleaner and repair service who will be able to completely eliminate the stain from your footwear for a fixed price. You may be able to find references for such cleaners at the places where you dry clean your clothes.